Low calorie Indian drinks would mainly refer to healthy juices. While whole fruits and veggies are the best way to get in fiber and antioxidants, this section is for those who cannot add them to their daily low cal menu. Also it is better to avoid sugar or keep it as low as possible. 2.They are rich in antioxidants like vitamin A and C.
3.Greens when included provide Iron. 4.They keep you full for some time and avoid bingeing on unnecessary unhealthy snacks. You can explore any combination of fruits and / or vegetables to make healthy drinks. We have tried and tested and shared a few recipes here just for you. 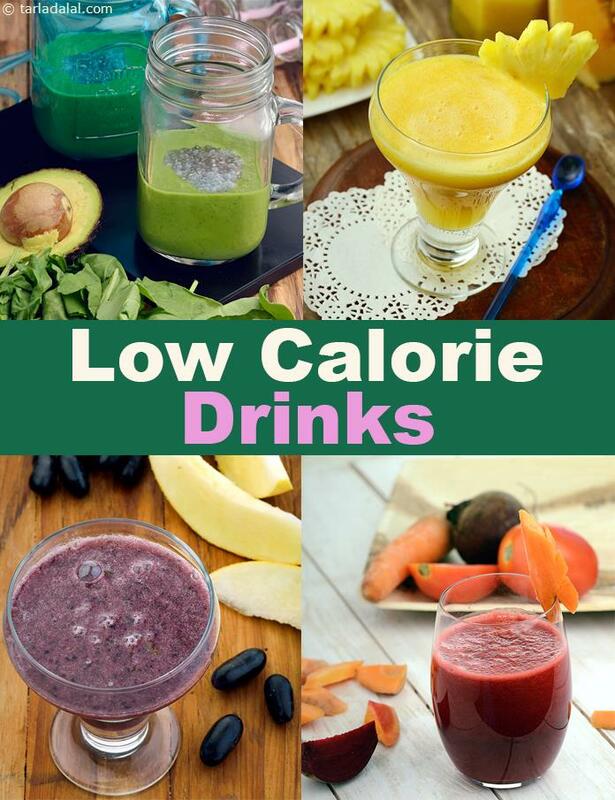 Here we bring you tasty low calorie drinks recipe using an array of fruits. Melon Punch is loaded with antioxidants and flavonoids like resveratrol and it’s a great cleansing drink that will make your skin glow and also protect your body from harmful toxins. Muskmelon Watermelon and Wheat Grass Juice is a unique fibre rich drink to start your day with when you’re on weight loss diet. This sweet and tangy Muskmelon and Pineapple Juice tastes brilliant even when sugar or salt is not added. I bets you must have never thought of mixing these two fruits together. Make your drinks nutrient packed by adding both fruits and vegetables in them. Palak Kale and Apple Juice is amazingly tasty with mild flavour of spinach and kale leaves, these are from the most nutrient-dense ingredients. Try this mouthwatering Beet Treat for breakfast and it will kick start your day, provide energy and also give a boost of nutrients. This Carrot and Black Grape Juice is high in nutrients like Vitamin A, Magnesium and Phosphorus. Black grapes perk up the juice with their sweetness so there is no need to add extra sugar. With all the goodness of nutrients under its roof, these low calorie drinks are definitely worth a try and enjoy our other low calorie articles below!